When Rover, a real dog, is transformed into a toy by a wizard, Rover sets out to locate him in order to correct the wrong that has been done and find a way to become a real dog once more. While on holiday in 1925 young Michael Tolkien lost his beloved toy dog on the beach. To console him, his father, J.R.R. Tolkien, invented a story about a real dog who is turned into a toy by a wizard and sent by a ‘sand sorcerer’ to the moon and under the sea. More than 70 years later, the adventures of the dog Rover, also known as ‘Roverandom’, are now published for the first time. They have been edited from the original typescript by Christina Scull and Wayne G. Hammond, who relate the story to sources ranging from the Norse sagas to E. Nesbit, and link it also to Tolkien’s other fiction, including 'The Hobbit ', the ‘Father Christmas’ letters, and ‘The Silmarillion’. The book also includes five illustrations by Tolkien himself. Entertaining and rich in wordplay, 'Roverandom' will delight all readers who love a clever tale, and will be welcomed by Tolkien’s many admirers of all ages. Christina Scull is the former librarian of Sir John Soane’s Museum, London and the editor of the magazine 'The Tolkien Collector'. Her husband, Wayne G. Hammond, is Assistant Librarian in the Chapin Library of Rare Books, Williams College, author of the standard bibliography of Tolkien’s works, and a regular contributor of Tolkien notes to the journal 'Mythlore'. The couple live in Williamstown, Massachusetts. 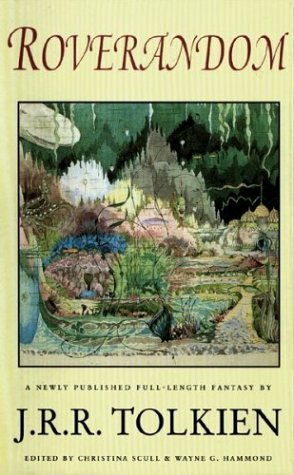 Their acclaimed study of Tolkien’s paintings and drawings, 'J.R.R. Tolkien: Artist and Illustrator', is also published by HarperCollins. Tolkien, J. R. R.; Scull, Christina; Hammond, Wayne G.
6. Roverandom Tolkien, J. R. R.; Scull, Christina and Hammond, Wayne G.